This is a Swamp People special edition version of CCI's classic Mini-Mag. 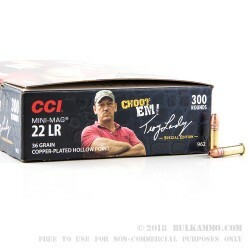 This round is endorsed by Troy Landry who famously uses CCI ammunition to take down gators. 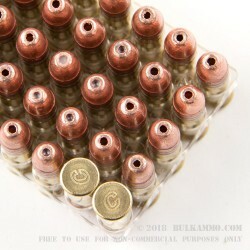 This round features a 36 grain copper plated hollow point projectile that leaves the muzzle at around 1260 feet per second. This round features clean-burning propellants and sure-fire CCI priming. CCI's Mini-Mag ammunition is legendary for it's consistent performance when hunting varmint (or gators if you want to get daring). CCI ammunition is produced in Lewiston, Idaho and is one of the most trusted brands for manufacturing high quality rimfire ammuntion. Grab several of these 300 round boxes before this limited release ammo is gone for good! Q: What is the fps. Of this Ammo ? A: Hello Maurice, CCI lists the muzzle velocity of this round at 1260 fps. Q: What is the FPS on these? A: Hello! 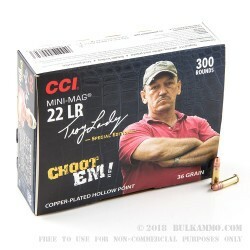 CCI lists the velocity of this ammunition at 1260 FPS.